Papacy: Elect One Pope, Get One Free? I’m finding myself getting short on patience, to put it mildly,with those who keep telling me that “Benedict is still pope” – having me choking on my morning tea – and, as if that’s not annoying enough, I get regular emails containing the same message from the other side of the world. Anything, rather than accept the fact that it is perfectly possible for a pope to be a bad pope. I mean, we’ve argued the Sedevacantist theory to death, now we’re faced with more Theology For Dummies thanks to the rise of Benevacantism… Is there no end to it? Anyway, when I complained to Athanasius about this annoyance, he emailed as follows, and subsequently gave permission for me to use his pearls of wisdom to kick start this discussion: note: Pope FRANCIS is the pope, a terrible pope, no question about it, and while we will certainly permit those of a different view to express their opinion, allow me to say at the outset that we are not about to go round in circles with this. The purpose of this thread is to nip this nonsense in the bud, so anyone who doesn’t “get it” reasonably quickly, can expect to be erased from the face of this blog, in due course. Be warned! No more Mzzzz Nice Gal! Below is Pope Benedict’s declaration of Papal Renunciation with highlighted words showing that he renounced both spiritual and pastoral aspects of the Papacy and then confirmed this by speaking of the election of a new SUPREME PONTIFF, where “Supreme” means over everything, not shared. He even stated that he was renouncing the ministry entrusted to him by the conclave and we know that was the Petrine ministry in all its aspects. These conspirators are just trouble making schismatics. I have convoked you to this Consistory, not only for the three canonizations, but also to communicate to you a decision of great importance for the life of the Church. After having repeatedly examined my conscience before God, I have come to the certainty that my strengths, due to an advanced age, are no longer suited to an adequate exercise of the Petrine ministry. I am well aware that this ministry, due to its essential spiritual nature, must be carried out not only with words and deeds, but no less with prayer and suffering. However, in today’s world, subject to so many rapid changes and shaken by questions of deep relevance for the life of faith, in order to govern the barque of Saint Peter and proclaim the Gospel, both strength of mind and body are necessary, strength which in the last few months, has deteriorated in me to the extent that I have had to recognize my incapacity to adequately fulfil the ministry entrusted to me. For this reason, and well aware of the seriousness of this act, with full freedom I declare that I renounce the ministry of Bishop of Rome, Successor of Saint Peter, entrusted to me by the Cardinals on 19 April 2005, in such a way, that as from 28 February 2013, at 20:00 hours, the See of Rome, the See of Saint Peter, will be vacant and a Conclave to elect the new Supreme Pontiff will have to be convoked by those whose competence it is. His resignation has changed the Papacy, more than any other event could have done. It has ‘de-mystified’ it. It has taken away the sense that the Pope is in some sense a sacred person, rather than a human being, brilliant or otherwise, fulfilling a sacred role. Archbishop Georg Gänswein’s recent remarks are always interesting, his recent interview is of particular interest. Gänswein, like his master Pope Benedict, is a subtle creature and should not be underestimated. I have always admired Ratzinger, especially as over the years his thought has developed.It is unlikely that Gänswein speaks with out Ratzinger knowing what he will say. It is fascinating what Gänswein says about the two rival groups before the last Conclave, it is also fascinating what he leaves us to speculate about the election of Pope Francis in the light of these rival factions. People have been pondering what the Archbishop meant by an ‘expanded Papacy’. I think that we need to start with Pope John Paul’s Et in Unum Sint 88ff – a document which seems to be as much the work of Cardinal-Prefect Ratzinger, as Pope Wojtyła. It recognises the role of the Pope today. it goes beyond the teaching of Vatican One’s Pastor Aeternus, where the Pope is seen as the locus of the authentic Church, and the ultimate judge, or rather definer. of where authentic Christianity ends and heresy begins. It is role well suited to a non-travelling Pope, with a limited staff, whose concern was essentially doctrinal, with a Secretariate of State, whose role was essentially concerned with relationships Catholic princes, and few other Cardinal’s with a tiny staff who held particular offices. Mass communications above all have changed the role of the Papacy, today he is no longer the prisoner of the Vatican. We are more likely to be familiar with the image, actions and words of the Bishop of Rome than we are with our own Bishops. The Pope is no longer ‘just for Catholics’, he has another role, that of pre-eminence not only among Christians but among ‘faith leaders’ too. As a ‘world leader’ he has a moral authority which goes beyond that of any other leader. He is also the head of one of the largest and most active NGO in the world. I think Benedict has always wanted to reform the Papacy, it is not unconnected with his attempt to reform the Liturgy. His writings recognise the rootlessness both in scholarship and tradition of Paul VI’s liturgical reforms, which rather than being a popular movement was something imposed from above through Papal authority. Vatican II, I am sure he welcomes but he has spoken and written about the Council of the Documents and the Council of Media. He has spoken of course of two hermeneutics, of rupture and continuity. Most especially in regard to the liturgy the Papacy itself has been the source of the hermeneutic of rupture, a rupture in the liturgy would for Benedict be a rupture in the entire fabric of the Church. My personal feeling is the Archbishop is right that neither Vatileaks or conspiracies were responsible for Benedict’s resignation, his devotion to Pope Celestine, his his symbolic leaving of his pallium on his shrine happened as early as April 2009, in retrospect it was an obvious sign of his intention to resign. I am sure his increased tiredness and difficulty in walking hastened it somewhat. 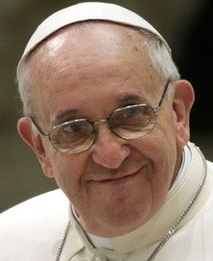 His resignation has changed the Papacy, more than any other event could have done. It has ‘de-mystified’ it. It has taken away the sense that the Pope is in some sense a sacred person, rather than a human being, brilliant or otherwise, fulfilling a sacred role. It strikes me as being highly unlikely that Pope Benedict was blind and deaf to “the so-called St. Gallen group” that included “Cardinals Danneels, Martini, Silvestrini or Murphy O’Connor”, what is perhaps interesting is that the Archbishop should mention them by name, and it is unlikely that he was unaware of who was their preferred candidate and where he would take the Papacy. So what are we to make of the idea of an ‘expanded’ papacy? I cannot help see that it is significant that in the light of Amoris Laetitia and the confusion that it has created that Archbishop Gänswein should point out that the Pope Emeritus is still alive and able to comment, albeit by his choice through the Archbishop. The ‘expanded papacy’ is presumably a reference to the fact that as long as Benedict is alive Pope Francis has to take his legacy into account. In the past once a Pope was safely in his grave his successor had the freedom to make use of his predecessor’s legacy as he wished, this is not an option for Francis. Benedict still has the capacity to cry out from his cloister, as we have seen recently over a misrepresentation of his words about Fatima. Gänswein, by this speech has rather clearly shown himself to be one of the chief custodians and defenders of the Ratzingarian legacy. It is not by chance that he reminded the world that Ratzinger was elected after his sermon on the evils of Relativism. Perhaps when Pope Benedict is dead we will see what those who keep legacy which has perhaps grown rather and will grow rather than fade, will do and are capable of doing. With a chatterbox former-Pope giving daily interviews with Scalfari or some other journalist of choice, or just picking up the phone and sharing his ideas with anyone in the world he wants to – well this produces a very interesting slant on an ‘expanded papacy’. Not only will the Cardinals in the future be electing a Pope but also someone who might in just a few years become an ex-Pope. I am sure Archbishop Ganswein used the term ‘expanding papacy’ to mean simply a changing or developing papacy: de facto the Papacy has changed since the First Vatican Council. De facto Pope Benedict’s resignation was the key change. Ganswein describes Benedict as homo historicus, quite what he means I don’t know but Benedict has the clarity of vision to see what is likely to happen in the future. I am sure he expected the St Gall mafia’s candidate to be elected. I am sure he understood the inevitable confusion that would result. I am sure he would look beyond his papacy to the next and beyond. One of the principles that seems to be at the basis of Benedict’s thought is that truth will triumph, because Christ is truth. Benedict has introduced the idea of a Pope not dying in office, he himself promising obedience retired to a Vatican monastery and has rarely broken his silence. The important question is not what Benedict will do but what would Francis do if retired or was forced from office. Presumably he would not retire to life of prayer but probably become a curate in some poor South American parish, would he remain quiet? It is highly unlikely, and probably impossible for him. John Paul set down strict rules about forbidding lobbying amongst Cardinals, human nature would suggest this unreasonable. I am sure wherever two are three Cardinals are gathered, and they have kicked their shoes off they start talking about who is likely to be the next Pope, and who is likely to vote for who. For the good of the Church it would be irresponsible not to do so. In the same way I am sure any conversation between Cardinal is a bit like a job interview – with the under-riding idea of will this man be a suitable next Pope. I think one of the things that could well develop is a fixed term papacy, an expectation that the Pope will retire after five or six years or when he has reached 80 or 85 he will become a former-Pope. Would it be possible that with two or three pope’s emeritus around they develop a particular role, as advisers to the reigning Pope? I rather like the idea of retired Popes Home with popes in vary states decrepitude eager to advise their successor, whilst they scheme and skype friends in the media, some maybe doing an occasional television interview or ‘going viral’ on the net. Should Papal Office Have Time Limit? The Catholic Church should not have “leaders for life” in its ranks, otherwise it would risk being like a country under dictatorship, Pope Francis said on Friday. Francis, 78, has said before that he would be ready to resign instead of ruling for life if he felt he could not continue running the 1.2 billion-member Church for health or other reasons. “Let’s be clear. The only one who cannot be substituted in the Church is the Holy Spirit,” the Argentinian-born pontiff said in an address to some 30,000 people at an inter-denominational rally of Christians in St. Peter’s Square. “There should be a time limit to positions (in the Church), which in reality are positions of service,” he said in an address that was in part prepared and in part extemporaneous. In February 2013, Francis’s predecessor, Pope Benedict, became the first pontiff to resign in 600 years. Seems Pope Francis equates leadership for life with dictatorship. Is he right?